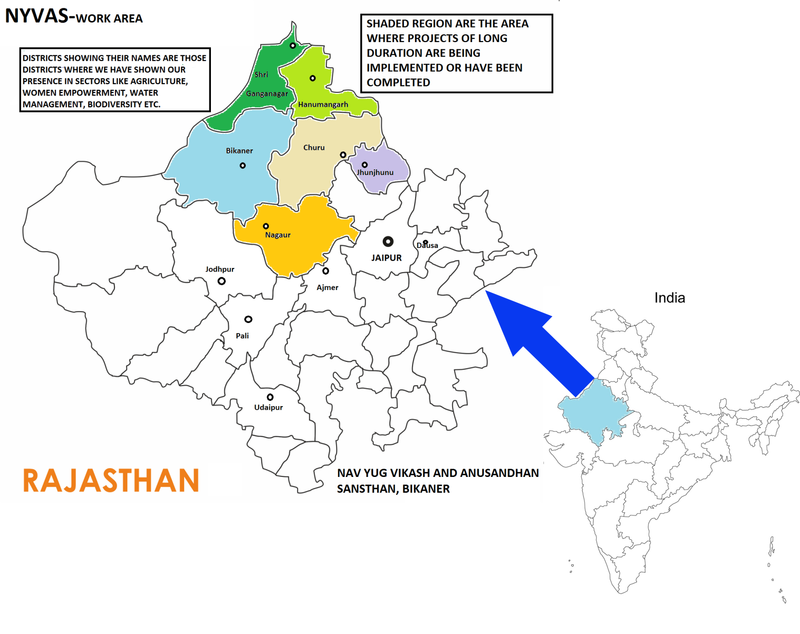 NYVAS work area is whole Rajasthan state. During the years we have made our presence possible in more than 11 districts of rajasthan state namely Bikaner, Churu, Nagaur, Sriganganagar, Hanumangarh, Jhunjhunu, Jodhpur, Durgapura (Jaipur), Udaipur, Dousa, Pali and Ajmer via various activities like micro planning, infrastructure planning, education, exposure visits, trainings, surveying and monitoring, SHG formations, camps, gosthi etc. through the projects of JICA, UNDP-GEF, EU-SSP, ATAMA, SJSRY, BADP etc.